Women have been fighting for voting rights since the early Republic. Abigail Adams wrote to her husband and encouraged him to "Remember the ladies" as he wrote the Declaration of Independence. A Society of Patriotic Ladies, Library of Congress. The Declaration of Independence, written in 1776, states that “all men are created equal.” That same year, Abigail Adams wrote to her husband, John, who was working to establish the new country’s laws. She asked him to “Remember the Ladies.” Abigail Adams wanted women to have more rights under the new American government. Her husband responded, “We know better than to repeal our Masculine systems.” He believed women influenced society without political power. According to this popular viewpoint, women were supposed to morally influence their husbands and raise virtuous sons. Women could not vote, but many men could not either. The United States Constitution did not guarantee the right of suffrage. Most states required that voters own a certain amount of land. Landowners, politicians believed, had a stake in the success of the nation. Other states required voters to pay a tax. Enslaved blacks could not vote; few Native American men or free blacks could either. After the revolution, the laws of coverture, established during the colonial period, remained in place. These laws ruled that when women married they lost their legal identity. Women could not own property, control their own money, or sign legal documents. Instead, their husbands, fathers, and brothers were expected to manage these responsibilities. Men were supposed to represent their wives, mothers, and daughters in politics. Even though she could not vote, Abigail Adams advocated for women’s rights through her writing. Other women did the same. Enslaved poet Phillis Wheatley’s popular 1773 book contested stereotypes that women and Africans had inferior intelligence to white men. In 1790, Massachusetts native Judith Sargent Murray questioned the status of women in her essay “On the Equality of the Sexes.” Two years later, British philosopher Mary Wollstonecraft fueled conversations about women’s rights in the United States with her book The Vindication of the Rights of Women. 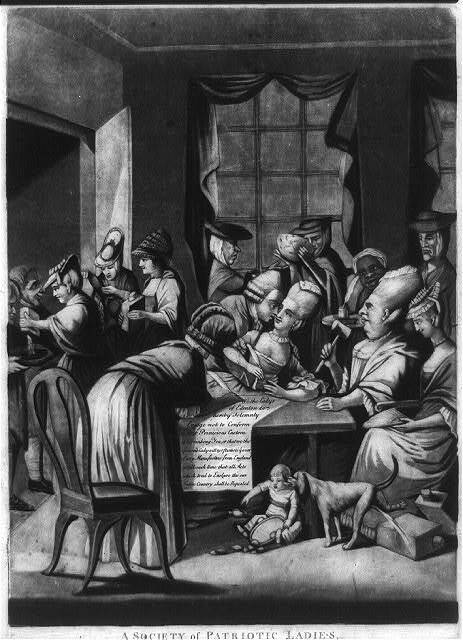 Despite the fact that the American Revolution had ended, Americans continued to debate the role of women in society. What was US culture's view of women's roles? Why didn't women have right to vote? How were they represented legally? What was the practical effect of not having a legal identity? What kinds of rights did women have? What kinds of rights did women not have? Judith Sargent Murray was a radical thinker for her time; born in 1751, she did not believe traditional women’s work was intellectually stimulating. Her essay, “On the Equality of the Sexes,” was first published in 1790 by The Massachusetts Magazine. It focused on the differences between minds and the need for stimulation. Murray saw no reason women should not be educated or valued the same as men. Mary Wollstonecraft was a writer and advocate of women's rights. Phillis Wheatley is regarded as one of America’s first poets. She was born in 1753 in Africa, was then captured by slave traders, and sold to the Wheatley family in Boston in 1761. The Wheatley family saw to her education, and she was able to read within sixteen months of being brought to the United States. As a teenager, Wheatley began writing poems. Her first poem was published in 1770 entitled “An Elegiac Poem, on the Death of the Celebrated Divine George Whitefield,” and brought her much notoriety. Then in 1773, Wheatley published her first collections of poems in Poems on Various Subjects, Religious and Moral. This was the first time a book written by an African American woman had been published and only the second time a book written by a woman had been published in the United States.